There’s nothing worse than forgetting to buy your ticket for the latest jackpot, and seeing your numbers come up. Fortunately, we’ve got you covered! With our AutoPlay feature, we will automatically purchase your chosen tickets each week, so you’ll never miss a draw again. Whether you’re going on an extended holiday, planning your budget or just want to be in the draw each week, AutoPlay is the best way to guarantee your entry and your chance to win. You can customise your ticket to include your numbers and even set a minimum jackpot amount if you just want tickets in the larger draws. Available on most of our Oz Lotteries games, simply set and forget to be in the draw for your chosen tickets. It’s free, quick and you can cancel any time. Step 1: Login to your Oz Lotteries account. 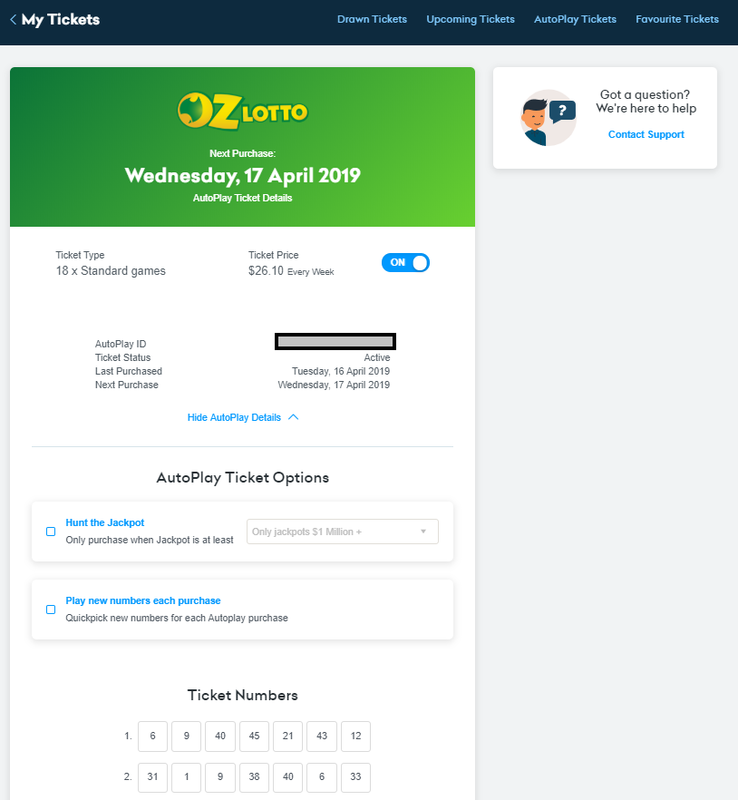 Step 2: Choose your ticket from the Lotto Games page, and select your numbers. Step 3: Choose whether you want to play for multiple draws OR AutoPlay. You cannot choose both. Step 4: Using the dropdown menu you can select how many draws you want a ticket in. 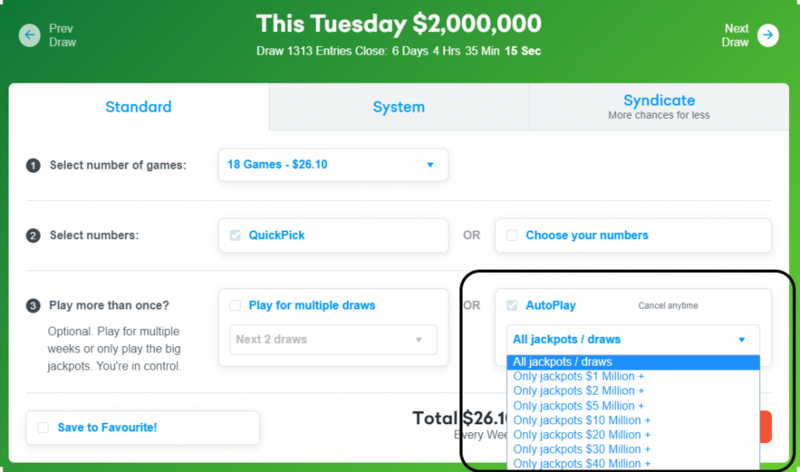 For the AutoPlay option, you can also choose to set a minimum jackpot amount. This means your AutoPlay won’t purchase unless the jackpot amount is over your chosen value. If you want tickets in all draws, hit the tick box and leave it set to “All jackpots/draws”. Step 5: Once you are happy with your ticket, click add to cart and follow the prompts to checkout with your chosen payment method. Remember to check your ticket details! Step 5: Your AutoPlay is now active and will automatically purchase for you each week. You will receive an email each week to confirm your ticket. Step 6: To edit your AutoPlay settings go to AutoPlay Tickets. You can change your payment method, check the details, and turn it on and off at any time. Step 7: To view the full details of your AutoPlay, click the blue ‘Manage’ button. 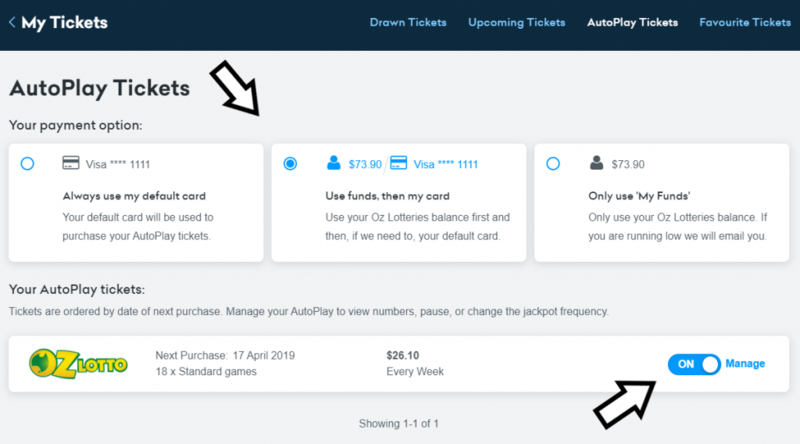 You can make changes including the minimum jackpot amount, and whether you want to automatically Quickpick new numbers for each AutoPlay ticket purchase. Simple! 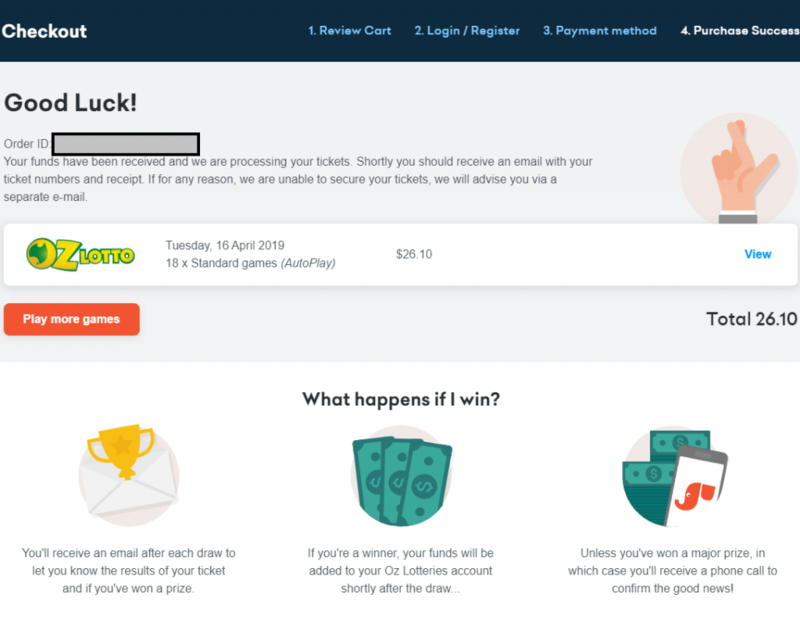 Once you have activated the AutoPlay function, you can pause it at any time, through your Oz Lotteries account at AutoPlay Tickets. To cancel and remove the AutoPlay please contact our friendly Customer Support team. 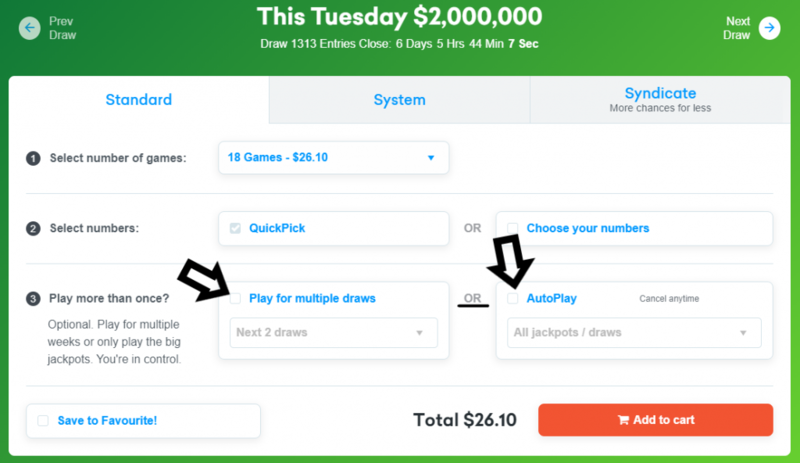 AutoPlay tickets will purchase the day after the last draw. For example, Oz Lotto will purchase your next ticket on Wednesday morning. If you have any further questions about AutoPlay or your account, our Customer Support team can be contacted between 8:30am – 7:30pm AEST Monday–Saturday by calling 1300 188 911, or email on support@ozlotteries.com.